Time for a new challenge over at Cuttlebug Mania - this fortnight's theme is 'Use a frame' and you can create your frame in a variety of ways eg. die cut, embossed, stamped, drawn, etc. Details of our sponsor/the prize to be won can be found over on the Cuttlebug Mania Challenge blog. - snippets of SU's 'Pear Pizzazz' from which I cut the green stitched aperture using the smaller of the two MFT dies in the 'Wonky Peek-a-boo Windows' set. Then I carefully trimmed around each aperture to form a green frame - which turned out to be only a whisker bigger than the aperture I'd filled in on the white panel, phew! There's lots of ways you can use this set of dies, I opted to make life difficult and go for a 'proper frame'. Trimming those outside edges of the green frames took quite a while with them not being at right angles to one another! But the same set of dies really works so well just used as apertures/windows, perhaps with one twisted inside another one on two layers of card. I'm sure I've seen this set being used on one of your blogs - Kathy K perhaps? I know I tend to get a lot of ideas for new products to buy from blog hopping, sigh. I hope you find time to play along with this latest Cuttlebug Mania challenge - we'd love to see you join in! There's loads of scope and different ways in which you can make your 'frame'. This is my final card for the Cuttlebug Mania Challenge as I'm stepping down from the team. The Playground will of course continue though! We're almost through May now - good grief! Once the year ramps up it really does seem to fly past. During this coming fortnight I have a long weekend away booked, in Stratford Upon Avon - for my old boarding school reunion. Lovely hotel, right beside the river and little boat cruises from their own jetty. So watch the headlines over next weekend for reports of pensioners doing swimming competitions along the river! One of my besties from those days is unable to make it this time (Hi Moira!) but our other great friend/partner in crime, Angie, will be there helping me to stir up trouble when we can. And, we three do plan to have a girly weekend away before too long to make up for the disappointment. Len and Parsnip will be at home but the Playground will be in your hands for a few days in the middle of the fortnight. I probably won't have a chance to comment on entries whilst partying. 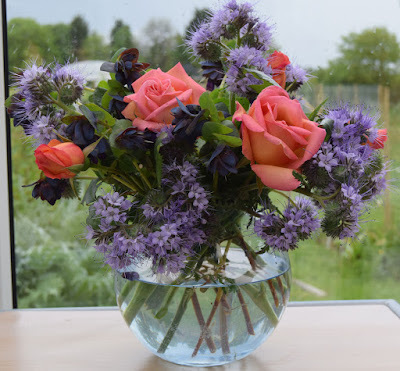 But, due to the new timings on picks and winners, I will be doing a scheduled post for the 'middle of the fortnight' as usual - on Sunday 4th June. As always, a huge thank you to everyone who came to play this past fortnight - loads of gorgeous entries. I so love seeing what you've been up to and also to pick up loads of ideas along the way (too many in fact!). - fussy cut and then glued all the little elements in place onto the image panel - gosh some were so fiddly! - meh, then had the beginnings of a card ...... hooray as it took ages! - glued the frames together. Used Stick-it sheet when die cutting the top one, then wiggled the two layers together as perfectly as possible before running the now double layered frame through the Cuttlebug with the two embossing plates AND an embossing folder - purely as padding, unopened. A tip I found this past week - and it worked beautifully! The 'Doodle Buds' are such a great set of stamps! Initially I wanted to stamp and heat emboss a few before colouring with Zig Watercolour brush markers as those have been sadly neglected. But, as it's a snippets card I felt bound to use those little snippets for the paper piecing. Took a lot longer and I had to stop and think about the ordering of the layers more than once - but it's another way to show how versatile this stamp set is. Each element is separate, bit daunting at first but good fun when you get going! And the die set I used is also great fun and very versatile - I used it recently HERE. The prize is the W Plus 9 'Doodle Buds' stamps set and the Avery Elle 'Postage Elle-Ments' die set - same as I used on my snippets card of course. There are lots of ideas about using the stamp set to be found on line and with a bit of clever masking you could build up a lovely bunch of flowers all ready to colour in. The largest die is almost 4.25" x 5.5" by the way, so it's perfectly fine for a lot of card sizes. I do like the American 4.25" x 5.5" size of card rather than our UK 4" x 6" size - it somehow just seems more balanced to me. I will split the prize if necessary, am mindful that not everyone would like both parts of the prize - although (as so often!) I do think they go together well. But, as always - both items are one complete prize if you wish to play for them as a pair. The Snippets Challenge will run for two weeks from now on and the Playground gates will close at 11am UK time on Saturday 10th June. The gates will open again at midnight UK time on the same day. Be sure to call back next week to see the winner of last fortnight's prize (the Chevron edger dies and the Flora cat stamps) plus my picks from the past two weeks - as well as another lovely guest designer too! - then I spotted a snippet of turquoise Core'dinations card still lying on my desk from another project - which was already backed with Stick-It adhesive sheet, wahoo! A fast and simple card as time isn't really on my side at the moment, but I couldn't let one of my favourite challenges slip past without making a Christmas card to play along. Plus it all helps with the total I'm aiming to make this year. Hello once again! Time for the fortnightly round up of the Playground which includes our latest Guest Designer, some 'picks' of the fortnight and of course the prize draw. 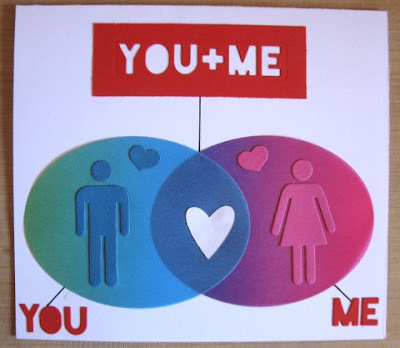 Brilliant, exactly the sort of card I've been showcasing lately and a perfect way to use up little snippets. But these aren't snippets of already patterned paper, it's white snippets, stamped to create the patterns! What a fabulous idea, so precise and neat as well! 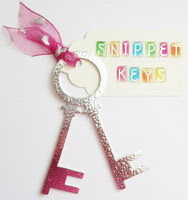 I'm excited to be the guest designer at Pixie's Snippets Playground. Since playing along in the Playground, I've got into the habit of reaching for snippets before cutting into a new sheet. In fact I don't really like starting a new one! Having said that, I still have a mountain of snippets. Mine are mostly white so that's what I wanted to use here. Apart from the base, all the rest is snippets. I punched the squares then used lots of different stamps to create the patterns on the squares but the same two ink pads. Thanks so much to Di for hosting the playground and keeping it all going. It's so inspiring to see the many and varied cards which people are clever enough to make. You'd think we'd run out of ideas but we never do! Back to crafting, this is what I gleaned from Alison's profile: she's a Mum to three grownup offspring, who certainly has crafting in her blood with sewing, lace making and also hand making paper as 'strings to her bow'. I then snooped over at Mrs A's Butterfly Challenge and found out that it's only about five years since Alison actually took up paper crafting. And what a long way she's come since then - I would be delighted if more of you follow her (pretty please)! Thank you so much Alison for making such a stunning snippets card as our Guest Designer this fortnight, it's a real pleasure to have you as GD - and to have learned more about you in the process of course! Running the Playground is a real pleasure for me - more so since we switched to fortnightly challenges - and without you girls there would be no Playground! This is such a clever card, made by Alice (scrAPamondo)! The theme of the main challenge that Alice created this for was a Venn diagram (that took me back in time!) and I just love this card - sheer ingenuity. And what a super card from Lynn (Linby) as well. Lots of little snippets used to create this brilliant scene - very cleverly done so that the perspective is just right as well. And, Lynn has been putting a new die cutting machine through its - Crafters Companion Diamond Press. Very dinky and just perfect for using with snippets - don't shoot me, I'm only the messenger! And last but not least, AJ made this fabulous 'concertina' card. It's absolutely amazing and there's lots more photos of the card over on AJ's blog. So much attention to detail - it's been a real labour of love! Lovely images, ribbons, lace and plenty of sparkles make this into a really special card to be treasured. That's my three picks - I do hope they will inspire you as well girls. Of course we had loads of fabulous ways to use up snippets, so I do recommend that you grab a cup of coffee and spend some time visiting blogs - the thumbnails with links are always there for you to look back over. Hope you come back to play again soon Monica! Well done Megan - can you please drop me an email with your address in and I'll post your prize off as soon as possible! My email address is on the right hand side bar. Keep those snippets entries coming girls, you still have a week left to play HERE remember! And the prize is a MFT 'Chevron Edger' pair of dies and a set of Waffle Flower 'Flora Cat' stamps. Do remember it's Rudolph Days coming up on 25th until 31st May - over at ScrappyMo's! Time to perhaps make a Christmas card or two? 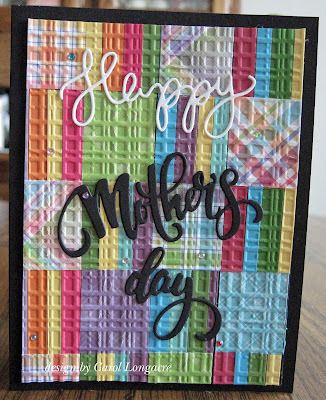 Quite an easy one layer card to make, once I came across the idea for the design on Pinterest. This is the blog post I eventually traced it back to - loads of good ideas to be had there and on the rest of Shel's blog, especially for those of you who are Stampin' Up enthusiasts! Coo, that went quick! It's time for a new challenge over at Cuttlebug Mania - this fortnight's theme is 'Use a tag' and we're looking for a project which is either just a tag, or has a tag added to your creation. I hope you find time to play along with this latest Cuttlebug Mania challenge - we'd love to see you join in! We're now galloping through May - and we do have signs that Summer is lurking around the corner - yippee! Spike and Co. are feeding well and the birds are busy nesting, feeding and having endless swimming sessions in the birdbaths! My visit to hospital was a little more productive than I thought, had x-rays taken - and after those are reviewed there may or may not be a MRI scan as the next step. Watch this space folks :) But don't hold your breath either!! As always, a huge thank you to everyone who came to play this past fortnight - loads of gorgeous entries. The way I tackled the card is so much easier than trying to make everything line up to the exact dimensions as you go along - I made sure there was plenty of spare card to trim off the panel at the end of assembling it and it works a treat! Probably don't need to spell out what this fortnight's prize is made up of do I then? The prize is the Waffle Flower 'Flora Cat' stamp set plus the Frantic Stamper 'Chevron Edgers #2 - 130 degrees' die set, exactly the same as I used today. The dies are 5.5" across by the way so are fine for a lot of card sizes. I will split the prize if necessary, am mindful that not everyone would like both parts of the prize - although I do think they go together well. I'm more of a doggy person but can still see me using my own set of these stamps quite a lot - and they would look pretty good without any colouring either! And of course, you may already have the dies or very similar as they've been around for a little while now. But, as always - both items are one complete prize if you wish to play for them as a pair. 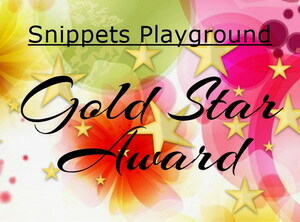 The Snippets Challenge will run for two weeks from now on and the Playground gates will close at 11am UK time on Saturday 27th May. The gates will open again at midnight UK time on the same day. Be sure to call back next week to see the winner of last fortnight's prize (those fabulous dies that you all seem to love!) plus my picks from the past two weeks - as well as another lovely guest designer too! - stuck the Santa in place using thin sticky pads and stepped away from the 'cooking pot' - job done, times six, yay! For ages I've wanted a rainbow die, but quite a lot of them are made up of only six 'stripes' - and I wanted the full 'Richard Of York Gave Battle In Vain' spectrum of colours! - found snippets of all seven rainbow colours and ran them through the Cuttlebug using the rainbow die - making sure I kept the right pieces lined up in order on the desk! Tip, just to make the clouds look slightly different to one another, I flipped one the other way up (ie. top to bottom). Just a subtle change but it took away the 'samey, samey' look. Edit: Liz left a comment on here, which prompted me to go and check out her blog here. And I found the lovely card she made which first piqued my interest in rainbow dies - back in 2014! Do go and see, it's really worth a look! 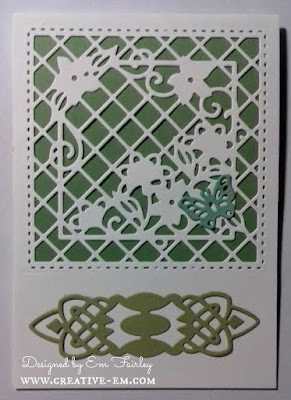 Love this card Em, fabulous die cutting - sigh, more on my wish list! Dies are from Spellbinders, Die'Sire and Creative Expressions and the aperture is backed with a snippet too. Em has been blogging since 2013 and I had a fascinating time reading her blog. This gal lives in the North West of the UK, yet seems more American than English. She's a brilliant card maker and a very loyal Playmate, rarely does she miss a snippets challenge. Even Miss Marple here couldn't really piece together very much about Em's personal life. She might be a Mum, she might not. She probably has American blood in her, but perhaps not. I think she possibly lived in the USA once upon a time, but maybe I'm wrong. In short, Em is a bit of an enigma - and I admire her for keeping us guessing! This much I do know, she has a very strong faith and also a very kind heart. Oh, and she's a great photographer too - that much I managed to trace! How about that then? 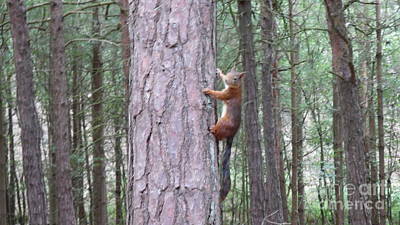 Not only a squirrel, but a red one. And they move so fast too! Thank you so much Em for making such a stunning snippets card as our Guest Designer this fortnight, and also for stepping in at such short notice. Saved my bacon! In future I'll make a point of emailing for a GD as soon as the interim post (like this one) is published as it really isn't fair on any of you. Normally I'm in reasonably good time - and in fact if this happens again I'll most likely just have a week minus a GD rather than mess people around. I also love this card, made by Jane W. Such a great way to use up snippet strips with some embossing, and either a punch or a die cut at the bottom of the strip. Clever stuff. The sentiment at the bottom right just finishes it perfectly! This is a design I keep forgetting about - and it's so perfect as well as being a super way to use up snippets! Janice brought this lovely card to share with us - and of course you don't need to stick with just four squares, although I love the symmetry of four. Irene who used to play here was so good at making cards like this - using 'inchies', often a panel of six or nine of them. A really versatile idea folks! That's my three picks - I do hope they will inspire you as well girls.Of course we had loads of fabulous ways to use up snippets, so I do recommend that you grab a cup of coffee and spend some time visiting blogs - the thumbnails with links are always there for you to look back over. For this fortnight I homed in on three ways to use snippets in a sort of geometrical way - but, as you all know, the possibilities are endless. Numbers are looking good in the Playground, 70 of you joined in this past fortnight - with no new Playmates. 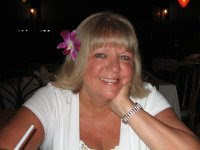 Well done Lynn - can you please drop me an email with your address in and I'll post your prize off as soon as possible! My email address is on the right hand side bar. Keep those snippets entries coming girls, you still have a week left to play HERE remember! And the prize is a popular one, a diagonal stripes cover up die plus a Memory Box sentiment die. I'm finally off for a hospital visit at Rheumatology this coming week - but am not holding my breath that they'll be any help at all with the back problem. Murphy's Law as well - this latest flare-up is subsiding again down to a bearable level. I doubt if I'll be entering any limbo dancing competitions just yet though! I thought I had a 'dud' die as the centre wasn't cutting properly - but when I switched to 200gsm rather than 250gsm card it worked perfectly! That's made me wonder about some other intricate dies I had big problems with in the past, now I think about it - it was always when I was cutting using a particular white 250gsm card! I know that SU card is always trouble free and that's slightly lighter weight/thinner as well - I think a big penny just dropped here, oopsie!! It does only apply to quite intricate dies though, bigger outline dies do cut just fine using 250gsm. The original intention was to add a few pearls to parts of the card and/or the cross but decided to call a halt rather than 'over egg the pudding'. Mia's name was on the printed insert I added, rather than the card front - again, to retain a more classic feel to the card. Gosh it's taken me a good while to have the 'savvy' to run die cuts through the Cuttlebug again once they're fixed in place. The difference it makes is vast! 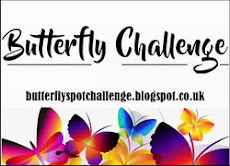 It's time for a new challenge over at Cuttlebug Mania - this fortnight's theme is 'Have wings, will fly' and we're looking for a project which includes a bird or an insect with wings eg. butterfly, ladybird, dragonfly etc. More than one is fine! - the white frame and inset panels were cut using an offcut left over from making the card blank and Just Right's 'Three in a Row' set. I've got a bit of a 'thing' at the minute about frames with white inserts but the inserts were likely to have a gnats whisker of green showing around the edge so I backed the frame with white card before popping the inserts in place. I know, it would only have been the thickness of the actual cutting line - but CDO (OCD) struck again!